Two defendants in Kemerovo mall bribery case detained, one more arrested in absentia | Russian Legal Information Agency (RAPSI). 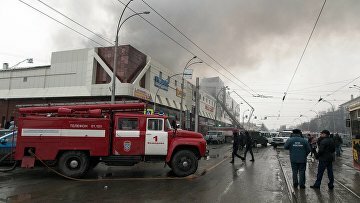 MOSCOW, November 1 (RAPSI) – The Central District Court of Kemerovo on Thursday ordered detention of two defendants in a case over bribery during reconstruction of Zimnyaya Vishnya (Winter Cherry) shopping mall’s building, that became a site of deadly fire in March 2018, and issued an arrest warrant for another one in absentia, the court’s press service told RAPSI. Thus, Nikita Cherednichenko, CEO of ISK Resource company, and Eduard Komkov, the son of the regional construction inspection’s chief Tanzilia Komkova charged with abuse of office, will be placed in jail until December 25. They are accused of taking a large-scale bribe. CEO of Kemerovo confectionery factory Vyacheslav Vishnevsky charged with giving a bribe is to be detained for 2 months after his extradition or arrest in Russia. According to investigators, he left Russia in 2016. According to investigators, in 2013-2014, Vishnevsky through an intermediary gave a 7-million-ruble bribe ($107,000) to Komkova, her son Eduard and Cherednichenko. The bribe was designated for help in favor of Vishnevsky. The fire occurred in the mall on March 25. According to investigators, 60 people including dozens of children were killed by fire. A criminal case was opened over negligent homicide, fire safety breach resulted in multiple deaths, provision of substandard services and negligence. By now, final charges are brought against 7 of 12 defendants in the blaze case. They are studying case materials. Investigation into the others is ongoing.